Consolidated gross public debt reached 69.5% of GDP in July 2016. In early 2014, it was around 52%. This rapid growth was caused by the rise in the fiscal deficit, due to rise in government spending above inflation, and also the high level of interest rates, which led to overspending with the payment of debt service. There was also a reduction in tax revenues due to the economic recession. Regarding the recession, beyond the cyclical component that has been the decline in international commodity prices, there was also a decline in general levels of confidence caused by the political crisis. 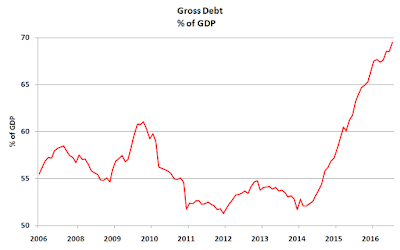 The perspective to ratio gross debt / GDP ratio will continue to grow in the coming years. The adjustment that the government is proposing should not be enough to stabilize the debt growth over the next 3 or 4 years. 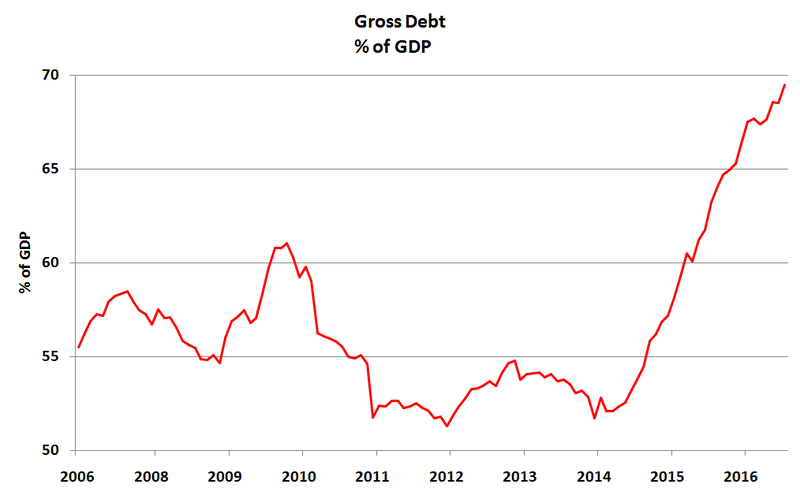 The graph shows the recent evolution of the gross debt to GDP in Brazil.